In this post we’re going to add to your tool belt of ways to manage and soothe performance anxiety. If you’ve read other Breathing 101 posts, you are starting to get a feel for the power of your breath. Being aware of your breath helps you to be aware of your state of mind: shallow breath = stress/anxiety, deep, full breath = relaxed, calm. This breath practice is a way to move to a non-anxious state by using sound to help extend your exhale. It is something you can practice back stage before performing, or while riding on the subway, in your car or while simply walking down the street. To begin this practice, sit in a comfortable cross legged position or in a chair with your feet flat on the ground, spine tall. Inhale through your nose and exhale through your nose while softly and gently humming on an /m/ sound and comfortable, mid-range pitch. There should be little effort in your hum and the jaw should be soft, the tongue resting between your lower teeth. As you continue your neck, shoulders and jaw will continue to release tension. The bee breath are calms the anxious, spinning mind and helps to lengthen the exhalation without additional effort – forcing the breath beyond your capacity will have the opposite effect. What you are doing is humming softly. There are many articles out there about the health benefits of humming. Including one from the New York Times that presents multiple studies on the effect of humming to help sinus infections, a short one from mindbodygreen on the health benefits of humming and one from relaxation lounge on the instant benefits of humming daily. Give it a whirl and see how you feel after! Breathing 101: Extending the Exhale. If you completed the breath ratio exercise and discovered that your inhale is longer than your exhale, or it is equal and you’d like to extend your exhale, here are a few tips on how to do that. As a reminder, an extended exhale helps to trigger the relaxation response, shutting off the flow of stress hormones (think about the need to fall asleep after you get home from a performance that ended at 11pm…). If you are a singer who struggles to sing longer phrases of music this exercise can help you as well – as will exercises that improve the efficiency of your vocal cord closure, but that’s another post for another day! ***Nota Bene: If you are an asthmatic, please don’t try to attempt to extend your exhale when you are symptomatic, you are likely to trigger an asthma attack. Please wait until your breathing feels calm to try this. You may do even better to begin by thinking about shortening your inhale rather than stressing your system with extending your exhale. 1. Lie on your back in constructive rest and allow the body to completely relax into the ground. 2. Place your hands on your belly and take a moment to tune into breathing that involves the motion of the belly out on inhale and in on exhale. 3. Do a few cycles of counting your inhalation and exhalation. Let’s say your ratio is 6 inhale, 3 exhale. Try first just thinking about slowing down your exhale to see if awareness is enough to bring about change. Inhale normally, purse your lips and exhale like you are blowing bubbles. Changing the shape of your aperture (opening) changes the rate at which you exhale, slowing it down. Inhale normally, and exhale creating a whisper sound in the back of the throat called Ujjayi breathing – Please, please, please don’t make yourself sound like Darth Vader. This should be a noise that is only perceptible to your own ears. If it feels easy to extend your count by 1, you can work more quickly toward doubling your exhale length, putting your count at 6 and 12. Once you’ve mastered things lying down, move on to trying them sitting up and then standing. As always, just explore without judgement and enjoy! The next topic for Breathing 101 is that of the breath ratio. In the first post we covered the basics of breathing and a few common breathing pattern problems. In the second post we looked in depth at breath awareness. Lie on the floor in constructive rest. Close your eyes and take a moment to settle in. Take a few breaths before turning your attention to your inhale. Count the length of your inhale over 4 or 5 cycles of breath. Though the pace of your counting doesn’t matter, try to be consistent about it so you get an accurate count. File away the number you get most often when you count: this is the length of your inhale. Now turn your attention to your exhale. 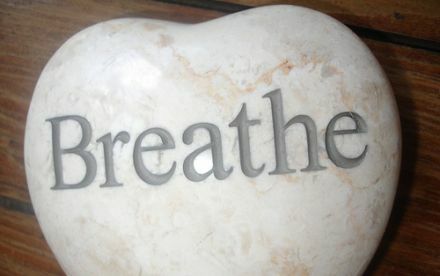 Count the length of your exhale over 4 or 5 cycles of breath. Again, keep your pace consistent to get an accurate count. Compare this number to the length of your inhale and you know your breath ratio! A ratio of equal length is what we strive for in physical (asana) yoga practice. In every day life an equal ratio indicates balance and ease as you move through your daily activities. A ratio of inhale longer than exhale means you are over inhaling. When your inhale is longer than your exhale, you will over oxygenate the body and contribute to your stress level. Over breathing sets your sympathetic nervous system in motion (this is the branch of your nervous system that oversees fight or flight mode. While fight or flight mode is appropriate if you are running out of a burning building or away from a charging elephant, being in this mode as a chronic state will create a loop of stress and anxiety. You may over inhale out of habit, or if you are an asthmatic, it may be part cause, part effect of your asthma. A ratio of exhale longer than inhale means you are relaxing and also able to sing through longer phrases of your music! This process triggers the parasympathetic nervous system which governs relaxation. In this state you are able to be present to your surroundings, calm on stage and connected to your breath and body. In our next post we’ll look at some exercises to do to help lengthen your exhale and shorten your inhale. Stop what you are doing right now and lie on the floor. Well, maybe read through this first, but then lie down on the floor! 2. Rest your hands on your belly. 3. Allow your eyes to fall closed, turning your attention inward. 4. Breathe through your nose and notice the motion in your belly as you inhale and exhale. If your belly isn’t rising on the inhale, can you think about softening it – try softening your jaw first and see if that helps. It can take time for the belly to soften, we hold A LOT of tension in our belly area. Try letting go of tension as you exhale, imagining your body melting into the floor. 5. Once you feel the softeness of your belly, move your hands to rest on your rib cage. 6. Notice the expansion of the ribcage on your inhale. The lower ribs are where you should feel the most expansion as that is where the bulk of your lung tissue is. If your ribcage isn’t expanding, see if you can bring attention and intention to the lower ribs and see them flaring out in your mind’s eye. The ribs function like a pump handle on inhalation and exhalation. 7. Place the hands back on the floor. Continue to breathe through your nose and notice how the belly AND ribcage expand on inhale. Once you can sense the motion of your inhale and exhale in your belly and ribs. Turn your attention to the quality of your breath. Is it smooth and easy, or are you forcing with extra effort? Stop forcing, if you are. No one gets anywhere by muscling their way around. Are your inhale and exhale equally easy or is one held back? After trying this on the floor you can take it with you and do it at your desk, while sitting at the piano, driving in your car, eating dinner etc. Just commit to observing without judgement and see what you find out. Enjoy and let me know what you discover! *special thanks to my 3 year old who was remarkably compliant when I asked her to lie on the floor and let me take some pictures! When is that last time you took a really deep breath? As singers we tend to be more aware of breathing than the average person, but so many singers who have come into my studio in the last decade have needed to cultivate a deeper awareness and understanding of their breathing to ensure it is really working to enhance their singing voice and not working against them. Pranayama is the Sanskrit word for extension of the breath, or prana. Prana (breath) is the life force, or vital energy. At its best, the breath will help quiet a busy mind, revitalize a tired body and soothe a languishing spirit, not to mention what it does for the singing voice. If you have a breathing pattern that isn’t leading you down this path, it definitely isn’t helping your singing in any way. There are several problematic breathing patterns that I see regularly in my studio: reverse breathing, clavicular breathing, over breathing and breath holding. Reverse Breathing: in this state, the belly area moves in on inhale and the rib cage expands. The belly then moves out on exhale. I see this often in newer and younger singers. Though we are born belly breathers, we don’t often stay that way for long. When the belly isn’t soft enough to expand on inhale, your diaphragm isn’t allowed to descend and your lungs aren’t being optimally accessed. Clavicular Breathing: in this state, the lower ribs aren’t flaring out when you inhale. Instead, your breath is high and shallow. Clavicular breathing contributes the stress response which is fine when you are running out of a burning building and want adrenaline coursing through your body to keep you alert, but it is not what you want when you are performing. With this type of breath you aren’t accessing the lowest lobes of the lungs which are a key part of triggering the relaxation response. Over Inhaling: in this state, your inhale is longer than your exhale. This is common in singers who suffer from asthma, something that in my studio has been on the rise over the years. You can tell if you are over inhaling simply by counting the length of your inhale and the length of your exhale. Breath Holding: in this state, you take air in, but you hold it before engaging in exhalation. What should be a split second transition between the muscles of inhalation and exhalation gets extended and the breath isn’t optimally used and therefore your sound isn’t optimal either. As a young singer, I had this pattern until a movement teacher at the Chautauqua Summer Voice Program pointed it out to me. It was a revelatory discovery for me to go for a run and notice that she was completely correct. I took breath in, but didn’t let it out. It took work, but I was able to change my pattern in time. See what you notice about your own breathing over the course of the day. Do any of these patterns sound like something you are doing? Our next breathing 101 post will give you some pranayama exercises to work with your breath and keep it as free as possible.